Castel-Fosse is besieged ... For months, even years, the inhabitants of the fortress on the mountainside, known as Castel-Fosse, are in perpetual state of siege. Their own dead rise up to attack them, with more violence with each new assault. As the hordes of the undead grow, pernicious dark priests try to take advantage of the citadel's weaknesses to gain control. From now on, only four heroes can prevent the inevitable destruction of Castel-Fosse. 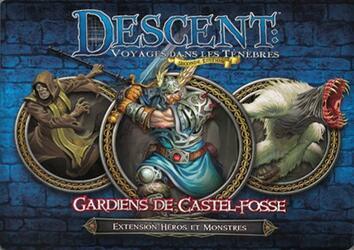 Add new legendary heroes, as well as monster abjects, to your Descent parts: Voyages in the Darkness Second Edition with the Heroes Expansion and Guardian Monsters of Castel-Fosse. Discover the unique characteristics of these monsters and heroes by living the quests included in this expansion, individually or through Rumor Cards. The Heroes and Monsters Keepers Expansion of Castel-Fosse contains 4 heroes, 3 groups of monsters and 2 new quests, adding new options to your Descent games: Dark Travels!